I was invited to participate in the the Asylum Geographies session at the International Conference for Historical Geographers held in London last week at the Royal Geographical Society. The two sessions, which spread across the whole of Thursday morning, were organised by Chris Philo and Cheryl McGeachen (both Glasgow University) and sought to highlight and explore the small group of researchers who investigate asylum spaces and geographies, to look at the wider societal roles and to explore the rise in the geographies of asylums. The first session contained four papers from Lauren Farquharson (University of Glasgow) looking at The Scottish Poor Law of Lunacy, Caroline Bressey (UCL) examining geographies of the cosmopolitan asylum, Cheryl McGeachen (Glasgow) looking at psychiatric art therapy and finally Sarah Phelan (Glasgow) who spoke about Thomas Ferguson Rodger, the first Professor of Psychological Medicine at the University of Glasgow. All four were fascinating papers looking at the past and present lives of people within the asylums and the asylums themselves. Caroline’s paper on the story of Caroline Brogdan who, when detained at the City of London asylum was living as a man was particularly fascinating and reveals the amazing stories that asylum archives contain, waiting to be explored and discovered. 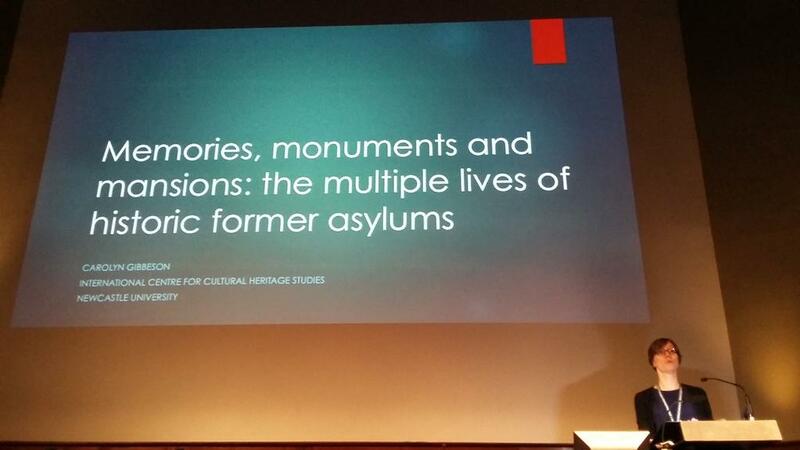 My paper Memories, monuments and mansions: the multiple lives of former historic asylums started the second session. This drew on my current PhD research looking at the reuse of former asylum sites and concentrated particularly on place attachment/ place stigma to explore how different groups of people connected to these sites feel about them and portray them through their engagement with the reuse process. It argued that the current literature on place attachment (and place stigma) focuses less on negative places and different types of attachment and that these are areas that my research highlights. The sessions that followed mine were Nicole Baur (Exeter University) looking at the interplay between planned and non-planned space within the Devon County Asylum, a paper entitled Madhouse: or an investigation into “the regions below” by Chris Philo (presented by Cheryl McGeachen as Chris was in Canada) and Ebba Hogstrom who highlighted how the past, present and future exists in the new House of Psychiatry in Uppsala, Sweden. All the papers presented provided a detailed and fascinating look into many different aspects of one particular building type and the research being done in this area. The links between past, present and future were really clear to see, as well as the continued discussions about how we present this work, given its often conflicting, challenging and difficult nature. I came away with renewed vigour and interest in my own work, as well as an interest in all the work presented in the sessions and some ideas for possible future research and publications should the PhD research time allow! It was a pleasure to be a part of the sessions at the conference and to be engaged in the continued discussions about these often forgotten places. A few months ago, I was invited to take part in Exhibition/Non-exhibition: Stretched Out, a seminar organised by Jason E. Bowman, Julie Crawshaw and Mick Wilson (Valand Academy, University of Gothenburg), which aimed to draw together researchers and practitioners engaged in investigations of the artist-led, instituting, the curatorial, the exhibitionary and the ‘stretching’ of artistic practice beyond ‘art-making’. 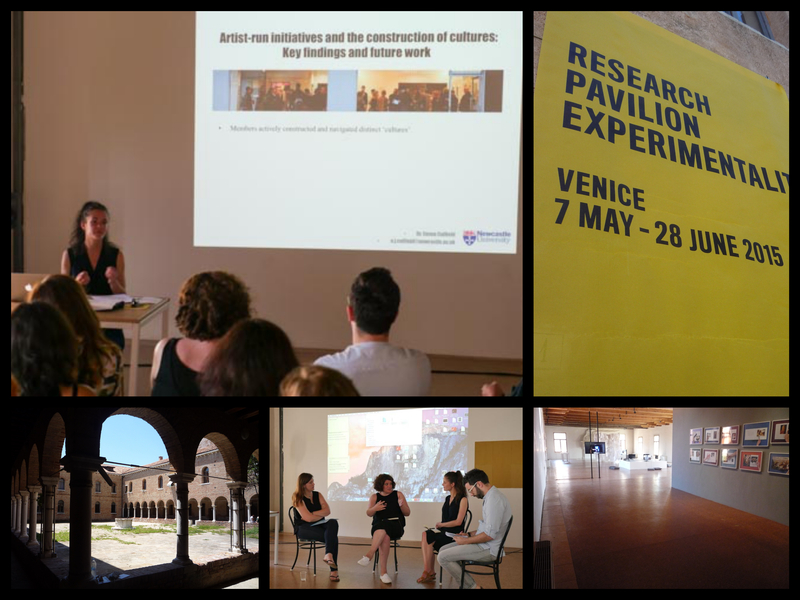 Held at the first pavilion in the history of the Venice Biennale to be dedicated to artistic research, the seminar began with an introduction to the Stretched project (a three-year long inquiry into expanded artistic practice and artist-led cultures at Valand Academy) from Jason E. Bowman. Four papers followed: in the morning session I drew upon my PhD research to argue against any kind of artist-run ‘culture in common’ and for a more critical approach to collective action, while Megs Morley explored instituting as a form of resistance with reference to her extensive research-led practice. In the afternoon, the Italian curator Valario Del Baglivo questioned the need for permanent space and suggested alternative strategies of solidarity, and Dr. Georgina Jackson spoke of the potential of the political, and political agency, in exhibition-making. Despite the varied nature of the presentations, during the discussions that followed (or during the ‘interrogative questioning’, as it was billed!) a number of key concerns came up, as expertly summarised by Prof. Andrea Phillips (Goldsmiths): how might we work together to maintain artist-run initiatives – and should we? How might the artist-led correlate with the idea of public space, and what do we lose by labelling it ‘artist-led’? How do institutional, economic, educational and structural formations limit the horizons of the possible – and why does knowledge ‘bleed out’ of the artist-led with every ‘new’ generation? As for my own work, I’ve been thinking about how to move beyond the case study approach to engage more adequately with structural, cultural, social and political ideals of the artist, art and art-making for a while now – and I’m still not completely sure how to go about this – but I now have some intriguing possibilities to follow up, and a lot of reading to do. My thanks are due to all those who shared, very generously, their thoughts with me, and to Valand Academy in particular for the invitation.